The CFD analysis presents a “picture” of the situation to date, which of course is susceptible to change over time. The unistall or inclusion of new equipment or the increase in the levels of use of the virtualization platform, for example, are factors that can modify the thermal dynamics of the installation. Any of these changes can lead to undesirable situations from the operational point of view: the installation concentrated in a cabinet of elements of high energy demand can, for example, lead to a high point air consumption that increases the speed of the fans, or create hot air pockets at specific points in the room. Many of these situations are susceptible to be adequately controlled by CFD simulation. That is why, should be offered the update of the CFD study once a year, and punctually if so required by the client in the event that it is necessary to make a significant change in the inventory or the location of the IT equipment housed in the Data Center. 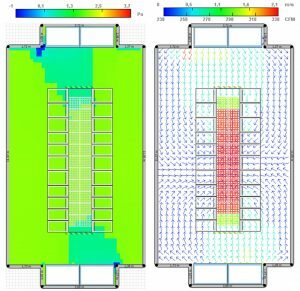 Thermal and Air Flow studies could help you to identify and solve different issues: hot spots, low efficiency with HVAC and more. Our software solution offers 85% precision. CFD will show the actual situation in terms of airflow of cool and hot air, temperatures in all the room at different high, pressure of air in the grids and easy identification of errors, failures, mistakes, hot air spots and a great value information about possible growing and neck bottles in the future. For a complete study we require the fulfill of an EXCEL file with data about the airflow in the grids, cooling units, consumption of power per rack, cooling, etc. Additionally front and rear 3 rack level thermal pictures are required to better identify the installation and easy calculus of the CFD Study. Most of the data are required for the standard audit and can be used for the other parts, not offered in this study.